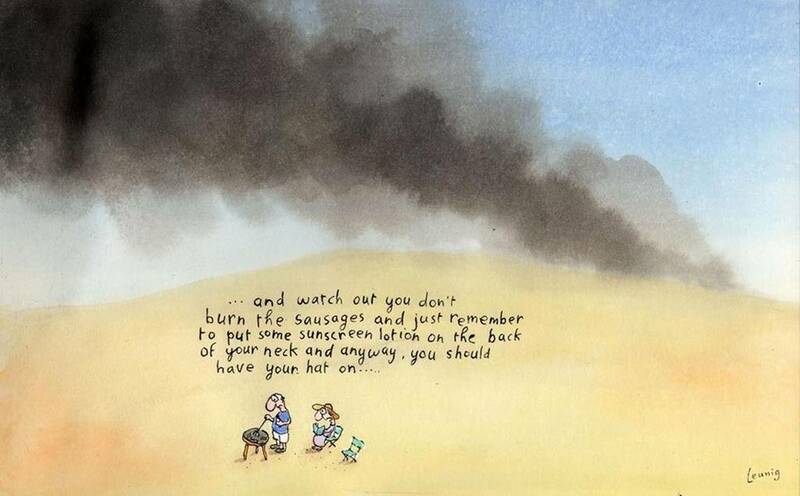 It looks like moron, bogan drunkards insisted on having an open fire Straya Day bbq despite there being a Total Fire Ban, and then setting fire to the bush around Waratah, twice, then abusing the firies for putting it out, twice. Good cartoonists can cover serious matters with very few words and a drawing. There is much in this one eg the landscapes either the beach or the future, the isolation of the family group and the dependence on advice to the individual while only group action will address the problem over the horizon. It’s good. I agree, it is a very serious matter. I presume they are husband and wife, and the wife is attempting to train her male. If it wasn”t so serious it would be funny.